And calm after the storm arrives, after the Christmas excesses austerity plans come January. Prosperous new year begins always pose an economic challenge to all restaurateurs. 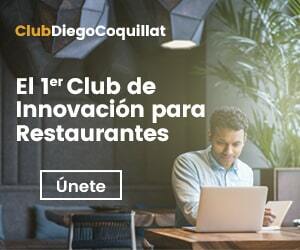 ¿What strategy marketing for restaurants You can prevent meltdown box? 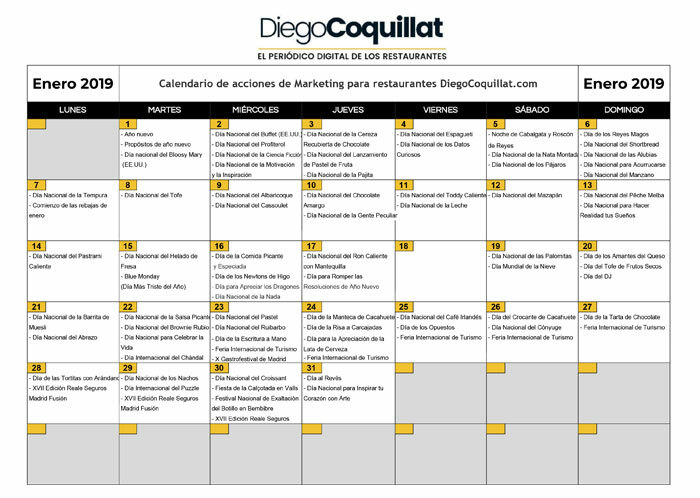 In this article we try some interesting alternatives and we propose a full calendar of marketing activities for restaurants, we trust, will make life easier for our readers. Red numbers, rickety portfolios and even some remorse. The year begins with a hangover consumer, but far from allowing this plummets, we have become accustomed to winter sales, almost without pause following the December gaps. During this time Restaurants can attract customers joining current. What these blackboards with menus show the percentage lowered! There is no better claim at this time of year that Very low prices. If the discounts in your letter are not, I always left enhance a cheap menu. If instead of 15 O 10 euros left in 13.50 O 9, It is already making progress. Remember crossing out the above amounts for a greater psychological impact. Another possibility is emerging is that of allying with nearby shops for the discounts obtained in other stores also entail bonuses in dining nearby. A) Yes, instead of buying a garment with 20% off, You might be able to conclude an agreement to make it a 15% and a discount voucher at the restaurant. nougats, marzipan and polvorones Unforgiven. Rare is that a couple of kilos is not caught during the holidays. And with a full year ahead, rare is that people do not go on a diet. This trend can be exploited to our advantage announcing dishes and low-calorie menus. Make known to those visitors determined that your restaurant can respect their New Year. salads, sauteed vegetables, meats and grilled fish and overall healthy food be your greatest allies in early January. And if these recipes have no place in your establishment you can always play the role of devil's advocate, enticing customers to break their promises. We all know that the end is what usually happens. January may be a perfect month to launch imported initiatives, extravagant bets and exotic products. A clear example is the Strawberry Ice Cream Day, It held in the middle of January in the US. UU., namely 15 of this month, when temperatures less invite consumption of this product. However contrast situations may call the attention of diners. In establishments where label is required, It may be interesting to do a day in which casual clothes are allowed. The International Day is celebrated Tracksuit 22.
further, in this first month of the year many unusual foods in our cards you have days in his honor in other countries. It is the case shortbread, the cassoulet, Hot Toddy or the Peach Melba, which they are the focus day 6, 9, 11 Y 13 January respectively. And we do not even talk about the possibilities offered by the party appreciation of beer (Get those cans import cabinet) or day of handwriting, that small neighborhood bars and restaurants is always present as talc stroke. Take advantage of as many ideas as you can in this boot 2019 for the January your local is just a gentle cuestecilla.